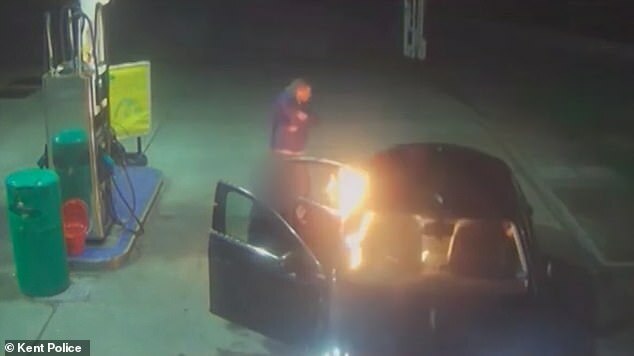 This is the shocking moment two drunk thugs poured petrol into a taxi and set it on fire with the driver still inside. 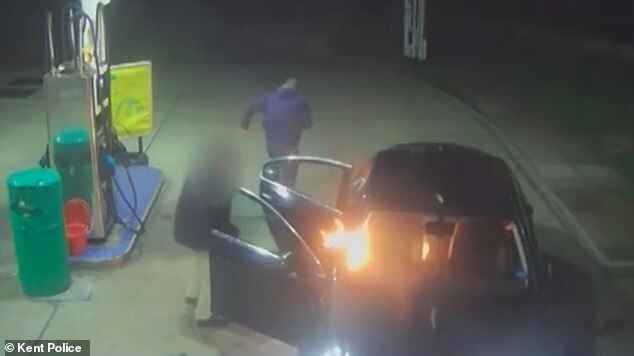 Warren Hearne, 36, and Danny Frost, 27, got into the cab and asked driver Abdulawar Malikzadev to stop at the nearby petrol so they could buy beer before launching the unprovoked attack. 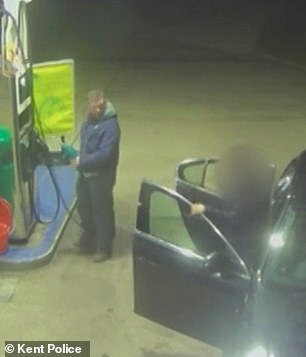 Father-of-three Hearne was seen on CCTV getting out of the car and stumbling over towards one of the fuel pumps. He then pulled the nozzle over to the taxi, soaked the back seats in petrol and set them on fire before running away. Cab driver Malikzadev was forced to jump out of his vehicle and scramble to get his belongings before the car was engulfed in flames. 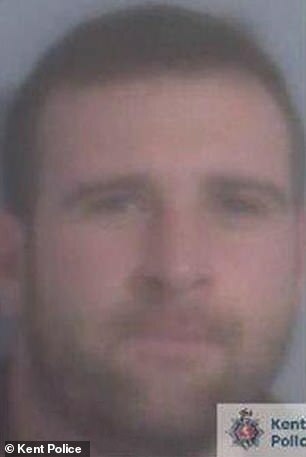 Hearne was jailed for six years and four months and Frost was sentenced to five years and seven months at Canterbury Crown Court after they both pleaded guilty to reckless arson. Malikzadev collected Hearne and Frost following a night out in the Kent town of Hythe. The pair hassled the cabbie the entire journey, opening the door while the taxi was moving and then berating the driver when he stopped. They then asked Malikzadev to stop at the nearby BP petrol station so they could ‘buy beer’ – but neither attackers went inside the shop. 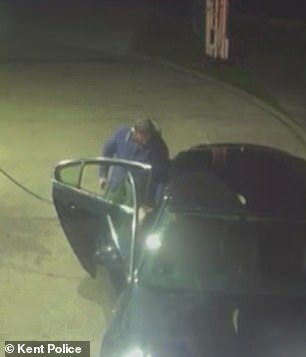 Instead, CCTV footage showed Hearne loitering around the taxi before stumbling over to a fuel pump. Hearne then pulled the nozzle over to the car and soaked the back seats in petrol. 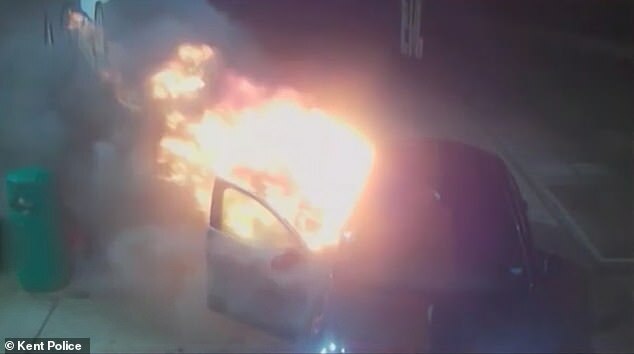 The cab driver became aware of what was happening soon enough to jump out of the car at the last minute, avoiding any potential injury, before the whole vehicle burst into flames. 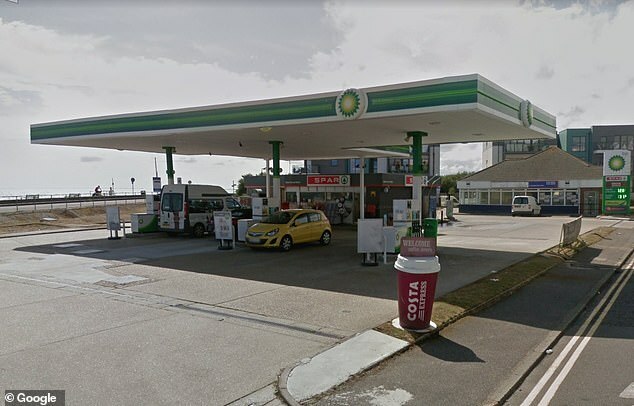 The driver succeeded in collecting his belongings before the flames spread and immediately called Kent Fire And Rescue service, as well as Kent Police. The forecourt was closed off and the fire was extingushed after the Fire Service arrived and spent three minutes trying to put it out. 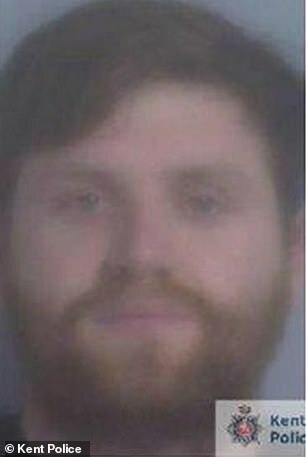 Prosecutor Miles Trigg told how the two men had been thrown out of the Neptune Pub in Dymchurch, gone to the nearby New Beach Holiday Camp and ordered a cab, which was driven by Malikzadev. They threatened Malikzadev with an iron bar and opened the door while the car was moving. At the time of events both Hearne and Frost managed to run away. But both criminals were identified by the CCTV footage and were arrested shortly afterwards. Investigating officer Detective Constable Kay Brown said: ‘This was an extremely dangerous thing to do, which could have caused significant harm to anyone nearby at the time. ‘Luckily the driver escaped the incident without injury but his vehicle, which is his livelihood, was destroyed in the fire. ‘There is no excuse for what they did and thankfully they will serve time in prison for this unprovoked and reckless attack on an innocent man.